The aim of Gau Raksha is to instil fear among the Dalits, adivasis and Muslims, to economically disempower rural working people, and to further consolidate the political dominance of the BJP. India’s livestock economy is among the biggest in the world. A ban on cow slaughter would either result in more and more unproductive animals being killed in most unscientific and cruel ways or would entail such a high cost for maintaining unproductive animals that cattle rearing would cease to be a profitable enterprise for farm households. 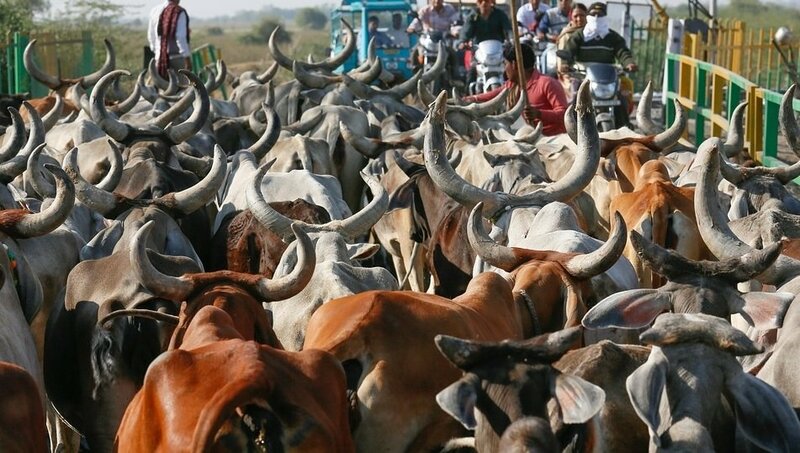 Restrictions being imposed on cow slaughter and the actions of the cow vigilantes would deal a serious blow to the agrarian economy and in particular to the livelihoods of the poor and middle peasants in rural India. As of the last livestock census, conducted in 2012, there were about 21.6 crore milch cattle and 8.4 crore male cattle. I am using the term cattle to include both cows and buffaloes. Over the last two decades, between 1992 and 2012, number of male cattle heads declined by 3.5 crores while number of milch cattle increased by about 4.6 crores. The increase in number of milch animals was solely on account of increase of 2.6 crores in the population of buffaloes and increase of 2.3 crores in the population of crossbred cows. Number of cows of indigenous breeds declined by 32 lakhs over these two decades. In case of bullocks, the decline has been primarily in the number of bullocks of indigenous breeds (3.4 crores). It is noteworthy that the indigenous (cow) bullocks are the animals mainly used in farming. Buffalo bullocks and bullocks of cross-bred cows cannot provide the level of draught power that is needed for farm work, and are only used, if at all, for light transportation. With the rising population of buffaloes and crossbred cows, India has seen a very substantial growth in milk production. With 15.5 crore tonnes of milk production, India is today the largest producer of milk in the world. Milk is a very important source of protein in Indian diets and thus crucial for nutrition. While there has been a marginal overall increase in the number of cattle, it has not kept pace with the growth of rural population. On balance, the size of cattle holdings of rural households has been falling for last several decades. NSS data show that the bullock holding fell from 90 animals per 100 rural households in 1992 to only 45 animals per 100 rural households in 2012. The size of milch cattle holding has also declined from 107 per 100 households 2012 to 93 per 100 households in 2012. Ownership of cattle is strongly related to the ownership of land. With a decline in access to areas for pasturing, only those rural households that have land can have cattle. Landless households that do not have land – either owned or leased – do not keep cattle. 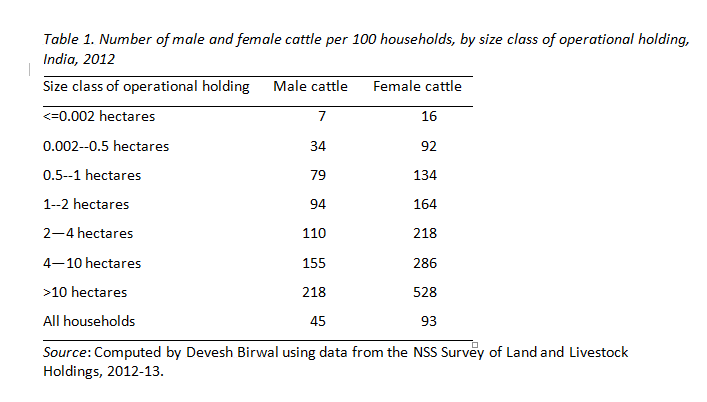 Table 1 based on the 70th round of the NSS Land and Livestock Holdings Survey clearly shows that the average size of livestock holdings increases as one goes from the smallest cultivators to households with large landholdings. Where have all the bullocks gone? In 2012, in comparison with about 21 crore milch cattle heads in India, there were only about 8.4 crore male cattle heads. That is, male cattle heads were only about 39 per cent of female cattle heads. Why and how is it that the total population of bullocks is much less than the population of milch animals? After all, cows and buffaloes produce male and female calves with equal probability. The answer to this question is rather straight forward. Use of bullocks in farming has fallen drastically with increasing deployment of machines. This has happened across all classes of cultivators. Rental markets in agricultural machinery have become widespread almost everywhere in the country, and even the households that do not own tractors and other machinery, can obtain them on rent. There are many reasons why machines are preferred by farmers over bullocks. First, access to fodder is limited and the cost of feeding animals is high. Secondly, machines perform a given task much faster than the bullocks. Getting agricultural tasks completed quickly is often crucial because of weather and, on irrigated lands, also because of multiple cropping. Thirdly, working with bullocks requires deploying greater amount of labour than working with machines. In many areas, the cost of hiring workers to work with bullocks far outweighs the cost of hiring a tractor. Finally, among poor peasants who migrate to cities in search of wage employment for part of the year, it is much easier to hire tractors for ploughing than maintain bullocks. With increasing rural-urban migration among the poor peasants, this has become an important consideration. Since bullocks have become unwanted, when a male calf is born, it is sold for slaughtering in abattoirs, abandoned in urban settlements, or even more commonly, simply made to die. In our surveys in North Indian villages, we have found that the male calves often had mysterious deaths. Given the stigma around the sale of cows and bullocks to a butcher, many farm households find it easier to put the animal to sleep, or worse still, to starve a young calf or expose it to biting cold on a winter night so it just dies. Let us now look at the milch animals that are reared for dairying. Most common indigenous breeds of cows have very low milk yields; peak daily milk yield of an indigenous cow is at best about 4-6 litres per day. Peak yield of a buffalo or a cross-bred cow could be easily three times or even more than that. This is the primary reason why the share of cows of indigenous breeds in total population of milch animals has steadily fallen: from 54 per cent in 1992 to 41 per cent in 2012. But economics of cattle rearing is not just about milk. Animals are not like other assets. They are a means of production but they also reproduce, they grow and they age. These biological processes have an important bearing on the economics of cattle rearing. As milch animals produce calves, these have to be fed. Since any farm household has a limited supply of hay and a limited capacity to maintain animals, the progeny of the milch animals has to be periodically disposed of. Selling these calves is also an important source of income. And when milch animals age, they have to be replaced. The cattle and the calves also provide some insurance against economic shocks as farm households can sell them when there is a drought. Cattle population shrinks during such years as the supply of hay declines and the prices rise sharply. Excess cattle are sold to traders for slaughter or for selling further to farm households in other areas that may not have been hit by the drought. Such distress sale of cattle is crucial for farm households to deal with income shortfall in years of crisis. Rural farm households have to dispose of unwanted and aged animals. While abandoned animals are a common sight in towns and cities, in rural areas, abandoned animals can cause havoc to standing crops. Because of this, farm households cannot just abandon an animal. They sell their aged milch animals to traders, who sell them to abattoirs. Modern abattoirs are essential for the bovine economy. Given the present population of milch cows in India, it can be estimated that about 3.4 crore male cow calves are born every year in India. Assuming that India has to maintain the level of milk production, and by implication, the current size of milch animal stock of India, we have to deal with birth of 3.4 crore male cow calves every year. If no male cow calves are allowed to be slaughtered, with an average age of even 10 years, one is talking of having a population as large as 34 crore male bullocks, five times the current living population of male bullocks. This is a conservative estimate as a cow or a bullock, if properly fed and taken care of, can easily live up to 15-20 years. In addition, no cow slaughter would mean that there would be about 6 crore unproductive old female cows to maintain. Even if we net out the current stock of cow bullocks and male calves (6.7 crores) to deal with the existing demand for bullocks for farm work and the current stock of female calves and old cows (5.5 crores) to account for the existing capacity of maintaining unproductive animals, we are still talking of maintaining an additional stock of about 27 crore unproductive cows and bullocks. Where would we keep them and what would we feed them? What would be the cost of maintaining these bullocks? Building cattle shelters for 27 crore unproductive cows and bullocks would require 5 lakh acres of land and a capital expenditure of about Rs. 10,00,000 crores towards construction of cattle shelters. The annual cost of fodder and veterinary care for these additional cattle would be about Rs. 5,40,000 crores. This is about 1.5 times India’s total defence budget and about 35 times what centre and all State governments together spend on animal husbandry and dairy at present. Maintaining these animals would require about 70 thousand crore tonnes of fodder. Where will we get so much fodder? India simply does not have enough land to produce so much additional fodder. Even if each animal drinks one bucket of water a day, you would need more water for drinking by these animals than all the water humans drink. It is clear that anyone talking of building gau-shalas and cow-reserves does not have any sense of scale. What would happen if cow slaughter is banned? Let me put it simply: if a farm household that has a cow has to feed it, and all its male calves, till they all die a natural death, no farm household would dream of acquiring a cow. Restrictions on cow slaughter, legally or because of fear of cow vigilantes, would make cattle rearing uneconomical. In all likelihood, restrictions on cattle trade and cattle slaughter would result in unproductive animals being simply killed in the cattle sheds. Abandoned cattle in rural areas can become a huge menace to crops. So, cattle would have to be killed. It is not difficult to imagine what would happen if slaughter of cows in abattoirs was not allowed: unproductive cattle would be poisoned, starved or left to die in cold. This would be the perverse outcome of restrictions on cattle trade and operation of proper abattoirs. Is that what the gau-rakshaks want? There is no doubt that the least painful death of an unwanted cattle takes place in a modern abattoir. Restrictions on cow slaughter would hit incomes of farm households, in particular, of the rural poor. Cost of rearing an animal is higher for landless and poor peasant households than for large landowning households. Households that do not own land maintain cattle by leasing in land, and using hay produced on leased-in land to rear cows. In coastal Andhra Pradesh, dalit households often take land on lease on highly unremunerative contracts, with rents as high as 75 per cent of the grain production, only with the hope that the hay produced on the land would allow them to rear cattle. Rearing cattle is a major source of employment for rural women everywhere in India. With increasing inequality in land and declining availability of fodder, women are finding it increasingly hard to gainfully engage even in cattle rearing. In Haryana, poor dalit women take female calves on lease, harvest sugarcane and wheat to get hay to feed these calves, so that they would get some income when these calves grow up and are sold. Restrictions on cow slaughter would simply mean that cattle rearing would cease to be a source of livelihood for rural poor households and in particular for rural women. It would further marginalise the rural poor and force them further towards destitution. Restrictions on cow slaughter would result in a decline in the stock of milch animals and thus in milk production. India currently has milk availability of 337 grams per capita per day. Milk is a crucial source of protein in Indian diets. Protein undernourishment are the more important reasons for high prevalence of stunting in India. India has 62 million stunted children, one third of stunted children in the world. These children need to be eating more of animal products: milk, eggs and meat. Any decline in availability of milk would have disastrous consequences for levels of nutrition. Gau raksha is a political project of the hindutva brand. It is a project to mobilise upper caste hindus on religious lines against dalits and Muslims. Its aim is to instil fear among the Dalits, adivasis and Muslims, to economically disempower rural working people, and to further consolidate the political dominance of the BJP.